On December 17, ZeroHedge asked Will Putin's Next Step Be To Sell Gold? I did not believe that when I saw it yesterday, and I sure don't today after viewing a few charts from Nick at Gold Charts "R" Us. In US dollar terms, Russia's gold reserves are worth about $0.4 billion less. Of course, Russia may have started selling in December, but that's not precisely what happened either. Please consider this snip from the December 19 Gold Chat article ZH fail on Soc Gen fail on Russia selling its gold. As is common in internet land, people pick up stuff by others without doing basic drilling down to the source. The reason you have to do this is because people often misinterpret the source. Other times the source is wrong. ZH quote the following from Soc Gen: "It appears possible that the Central Bank of Russia has started to sell off some of its gold reserves in December, with some sources reporting that official gold reserves dropped by $4.3 billion in the first week of the month." Now that is a very specific figure, $4.3b. It seems that Soc Gen got it from this Business Insider republication of a Vesti Finance article which said "On Thursday, the Central Bank of Russia announced that gold reserves dropped by $US4.3 billion in just one week, reports Vesti Finance." "Russia's international reserves for the week from November 28 to December 5, decreased from $ 420.5 billion to $ 416.2 billion, the central bank said on Thursday. ... For the previous week, from 21 to 28 November, gold reserves increased from $ 420.4 billion to $ 420.5 billion. 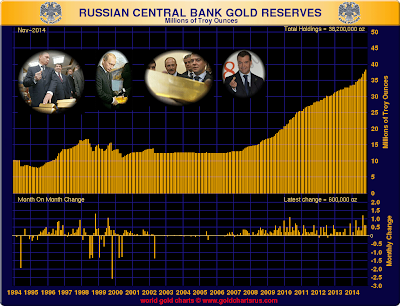 On November 14th the size of gold reserves stood at $ 420.6 billion, on November 7 - $421,400,000,000 rubles." Now the decrease they are talking about is $4.3b in total reserves but the headline mistakenly assumes it is all gold. The gold specific figures they mention show completely different numbers. This is precisely what happens when you are sloppy with links. My major criticism is not that ZeroHedge posted something inaccurately, but that he frequently fails to link to stories. On many occasions ZeroHedge states things like "Bloomberg says" and I spend 15 minutes looking and cannot find anywhere Bloomberg said anything remotely close to what was being attributed. I realize sometimes there is no link. On such occasions, I will say something like via email, no link available. In this case it appears the source of this misrepresentation was Business Insider who also got the story amazingly wrong. On December 12, Business Insider reported Russia Is Fighting Its Financial Problems By Selling The Gold They Have Been Hoarding. Russia is finally using all that gold they have been hoarding. On Thursday, the Central Bank of Russia announced that gold reserves dropped by $US4.3 billion in just one week, reports Vesti Finance. In the third quarter alone, Russia added more gold to its reserves than any other nation, according to the Telegraph. And over the last decade, Russia has tripled its gold stocks, according to data from the World Gold Council. Until recently, Russia hasn’t dipped into these enormous reserves. But now that the ruble is getting pummelled following the decline in oil prices and sanctions imposed on Russia’s economy by the West, Russia’s central bank is apparently selling off some of its gold reserves to fight inflation and the ruble’s decline. 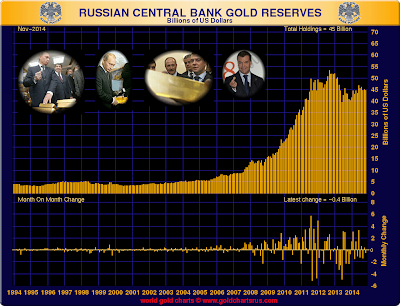 Russia is not selling gold, rather the US$ value of its international reserves fell by $4.3. Billion. Here is the opening sentence "Russia's international reserves for the week from November 28 to December 5, decreased from $ 420.5 billion to $ 416.2 billion, the central bank said on Thursday." "Editor's Note: Earlier it was reported that the Central Bank's gold reserves decreased by $4.3 billion, quoting Vesti Finance. However, in actuality, it is international reserves assets that have decreased — not gold. Appropriate changes have been made." Now how hard was that fact checking Soc Gen and ZH? This kind of nonsense is precisely why I am meticulous with links. I ask others to carry the same standard. Bloomberg is also terrible. In fact, mainstream media is horrendous in general. Many mainstream media news outlets only link to themselves. And when that happens there is no way to check the facts. Then nonsense like this happens. I rest my case.